I've been looking at the Raichu Canvas for almost a year going, "Do I have to have it?" The answer is, "Yes, yes I do," but now that I've made up my mind, it's harder to find! So, does anyone have one that they'd like to sell? A US Seller would be preferable, but I'm not too picky. The tag (whether it is there or not) and its condition are of little concern to me. 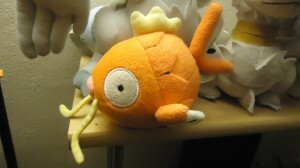 As long as the plush is clean and in good condition, I'll be very happy. I'm new and only have one feedback so far ( http://feedback.pkmncollectors.net/feedback/view/razeasha/ ), so if you need additional feedback, feel free to ask. I have Ebay, Etsy, and feedback on the egl_comm_sales feedback database to which I can link. 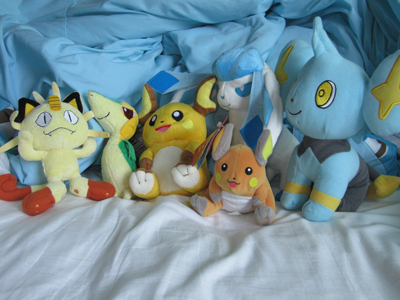 I really like the Victini Canvas plush but was also told that the Pokecen one is very lovely. The Pokedoll one also looks cute. I was wondering if there was a Victini collector out there who happened to have all three (or even just two of them) and would be willing to send me a picture of the cuties together, so I could look at what they looked like side by side and make up my mind. (You can tell I have trouble doing that, can't you? XP) The MPC and 7.5" Chibi Banpresto ones also look cute. Does anyone have an opinion on these? It's just more difficult for me to visualize things. You have no idea hoe many times peoples' pictures on here helped me get a better idea of what something looked like. Thank you everyone, and I hope you are all having good days/mornings/evenings. Y'all always make my day better! I have a few MIB figures and am toying with the idea of opening them for better display. What is your all stance on this choice? Leave it MIB or not? If you prefer MIB/MIP figures how do you display them? Oh man, do I LOVE bell plush!! My goal is to collect every bell plush :D I started this year and I have managed to get 12 so far. I am looking for MIB only! **The ones marked out I own. 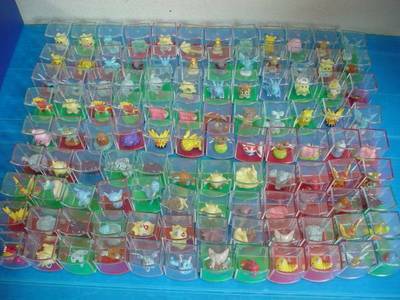 They are Vileplume, Clefairy, Machop, Caterpie, Poliwhirl, Electabuzz, Dratini, Psyduck, Pikachu (set 2), MewTwo, Gloom, and Dragonair. Please let me know if you have one for sale! Hey guys, it is me once again with another group auction. I am starting to really get into these. This GA is partially hosted by me, and the other host is actually shirohikarikaze . 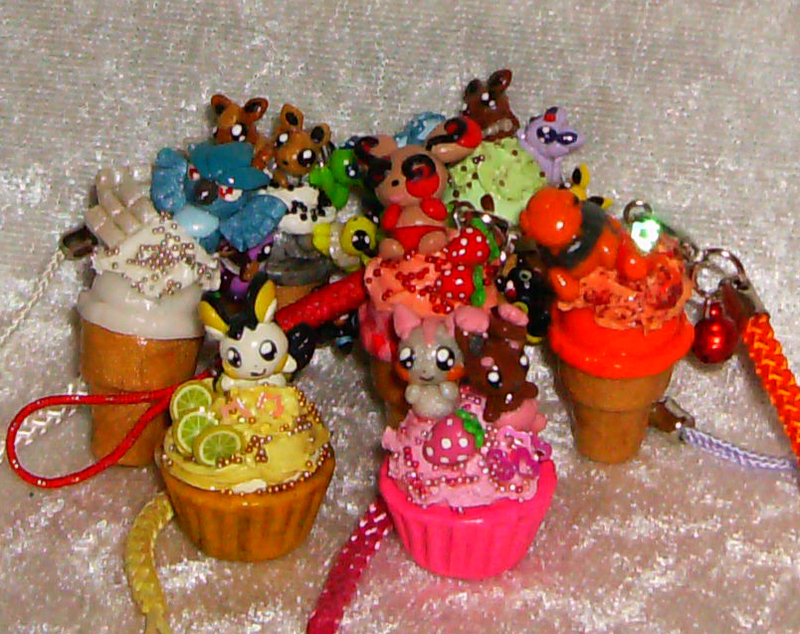 Shirohikarikaze received sales permission from entirelycliched on March 2nd, 2012. I will be claiming the the Buneary Pokedoll for $15. I will be doing the threads/spreadsheet while shirohikarikaze will be doing the bidding/shipping. Do not bid until all threads are up. Threads are up :D Bid away. A reminder my auction ends today at 5 central! MINI FIGURES! 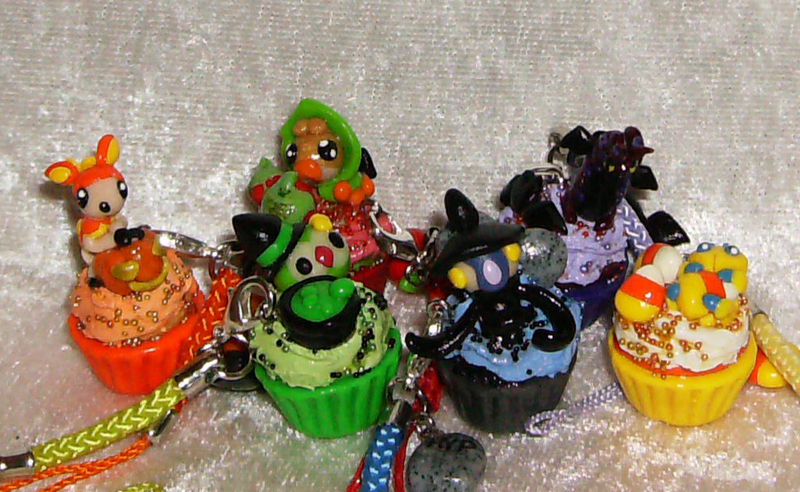 http://pkmncollectors.livejournal.com/13235040.html < My mini figure auction 95 Pokemon ends Thursday 5pm Mountain time! Lots and lots with out bids! so start bidding and don't forget my sales!!! 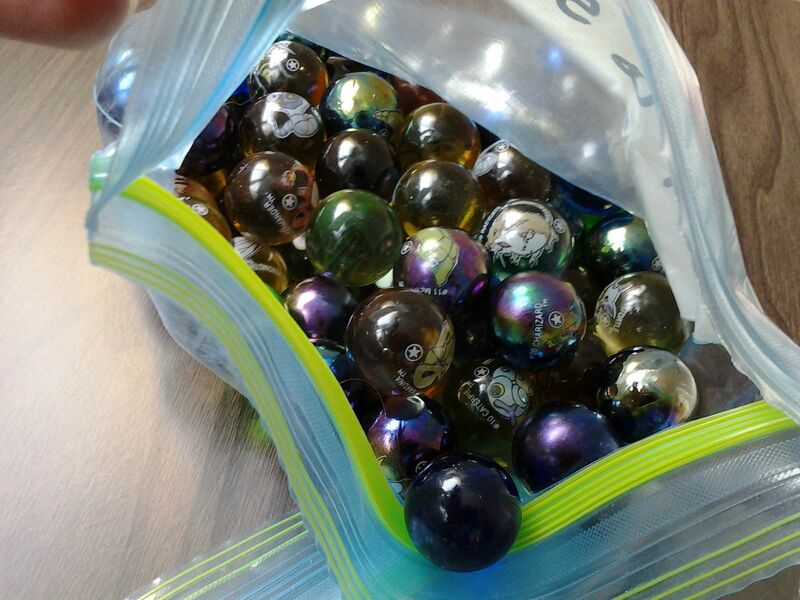 I love pokemon marbles. They are my favorite Pokemon merch to collect. My collection was okay, but nowhere near a complete set of the original 150 glass marbles. And then I saw a listing on eBay for somewhere around 200 marbles for a good price. Ah they're so lovely! And all stars too! But the question is, will this set complete my collection? Get Your Wallets Ready - Tomy is Making Plush of ALL the Eeveelutions!! we did indeed win our rare TCG posters!! with a teeny discount, too, that took care of the shipping cost. total raised: 447$. total owed with shipping: 440$. make the NOTE a copy of your won item/s from your total. and this is a final reminder to these three folks before a negative is left. please pay for your dot sprite charms. please go to the payment post ASAP! Alright I am dying for these Pair Pikachu phone straps. I don't know how much they go for but if anyone is willing to sell them please just let me know a price and hopefully I can afford them! Hello there, I'm just in the neighborhood to do some birthday/early christmas shopping and I'm wondering if anyone has some goodies to offer that feature the Koffing line? Also seeking Magmar's line and any character goods that feature Ghetsis. If there were none made, then whoops! Forgive me, I'm a little behind the times on this stuff aha. 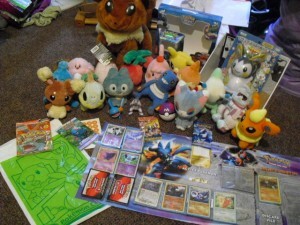 I'm not so much interested in plushies for Koffing, my buddy has most of them and I can't recall which she doesn't have. But anything else under the sun, I'd like to get my hands on. Off the top of my head I know she has the charm set from the rerelease waves, a luggage tag, some cards, battle coins and i think only part of a zukan? She's got a whole mess of the metal figures too. You would be shipping to California, in the US of course! I can't contain my excitedness. Like really, I waited till my roomates left before I opened it because I knew I'd spaz out!! What Pokemon do you want to see in the next wave of Pokemon Time? 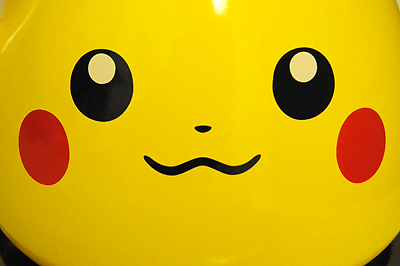 We've seen a lot of interesting and adorable choices for Pokemon Time characters. What Pokemon would you like to see the most? Obviously I want to see Gloom, but I'm most interested in the Pokemon people normally *don't* collect, but would want if they were Pokemon Time-ified. Maybe he would look like his Pokemon Snap self? 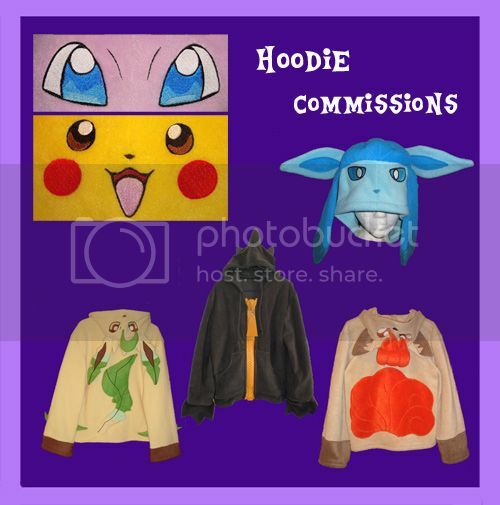 I'm now taking a couple hoodie commissions for completion by the end of November. For a quote, please note me on dA or email me at bahzi84@gmail.com I don't always get notifications of LJ messages. I've been sick these last few days, so when my Pikachu tea kettle came in I wasn't as excited as I wished I could have been. I didn't get a chance to open it until today since I've been bedridden. Now that I have, I can't believe how gorgeous it looks! It makes me wish I would have bought more from the Pikachu kitchen line. I know quite a few people from the community bought the kettle specifically so I thought I'd inform you on how I clean my kettles in case some people were nervous about using the Pika kettle. Some unusual 'Gets' and Wants! Hello there! Last week, I went down our garage only to find out that my long lost box of Pokemon wasn't really lost at all! 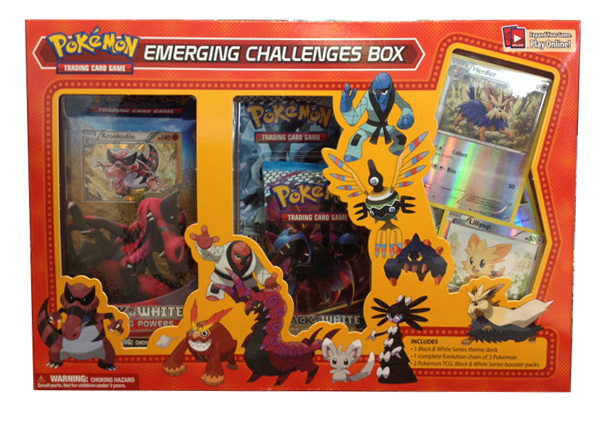 It comes in a box set with a deck, booster packs, and Reverse Holos of Stoutland and Herdier. I'm looking to either buy/trade for Lillipup on it's own (or with Herdier and Stoutland). Or to divide the box set up with someone. I have no need for the deck...and I could possibly keep the booster packs but all I'm really interested is is the Lillipup line cards. I think there are a few different decks you can get...I'm not sure how many combinations, but these are the pics I've found online - Link and Link2. Liepard from Freeze Bolt and Purrloin from Plasma Gale. And I'm also looking for the Servine card from the 2012 McDonald's promotion. Hello again everyone,I was wondering if you guys would do me a favor? I have a charizard plush and I'm curious to what exactly he is. If you read my previous posts you saw my dad got him off the side of the road. Any info would be appreciated. His styrofoam holding his neck and arms is broken so they hang a little and he has a big rip in his tail covered with duct tape.And say If you need a pic of him please! Thank you! Ok, here he is! Hi Guys and gals. I found this lot and was hoping to GB it, I would be willing to do the threads and such and need someone to help with the bidding and shipping. please let me know if you'd like to help out as I really want to get my hands on Sawsbuck! Hey guys! So I've started my plush collecting journey. 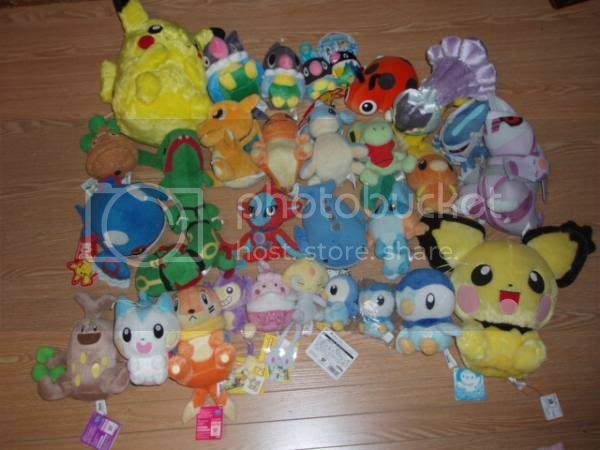 One plush of every single pokemon--no matter how big or small! I think I'm doing pretty well! 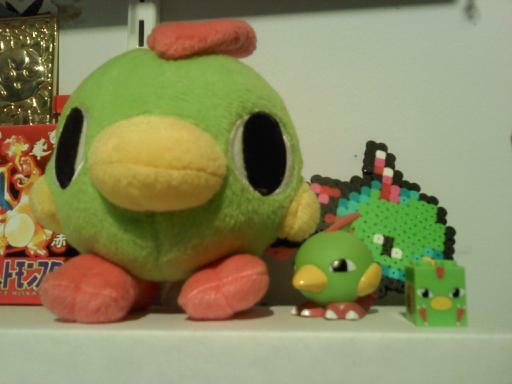 I also have a Tepig pokedoll and a Drillburr Jakks plush which'll hopefully be on the way soon! * how do you get photos onto a post? *how do you make an LJ cut? I hope to make lots of friends and collect lots more pokemon. My favorite pokemon are the eeveelutions, mainly espeon, minccino and deerling, as well as anything else cute. I hope you accept me in your community. hello everyone :) o0vailo0 and I would like to offer you lovely people two group buys by the same seller both are sets of 10 MPC plushes!! - We are not responsible for items lost in the mail. If you are concerned please pay for insurance. Corsola, Qwilfish, Staryu and Starmie Collections! I would like to apologize to all participants of me and saberalter's in-case GA as well as thank you guys for being so patient with things. Hi everyone, and good morning,afternoon, or good evening. Just a little reminder about this GA. There's about a day left on it, feel to come take a look at it ^w^ Thank you for reading! Hello community. :) I've been a regular lurker here for about a month and I finally decided to join for real. Actually I asked to join twice. The first time a week went by and I didn't hear anything so I tried again thinking I might have miss-clicked or something. I hope I didn't bother any mods. This is the longest post ever, but I had fun looking through all my stuff and reliving the memories of how I got them, etc. Hope you guys enjoyed it too if you managed to read all of this. I'm looking forward to participating in this community. It seems like a great place and I love seeing everyone's collections grow. Until next time! So on to the questions! 1. Which companies release eeveeloution merch? 2. Do you have to pre-order everything, or will they still be available when they come out? 3. Does the pokemon center release merch too? 4. Does anybody know if they will be re-releasing the canvas-loutions? I am seriously dying to know! Thanks so much guys, and sorry for the boring post! I was trying to make this post less boring and clever...but I can't think of anyway to do that :/ So be creative!